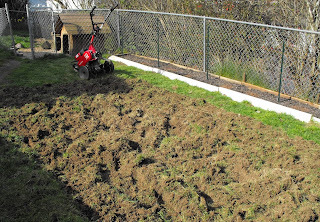 The first day of spring found our family wiping the sweat off our brows as we broke ground our on families first veggie garden. 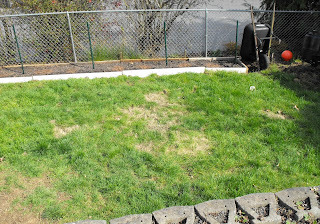 The area chosen for the plot was a grassy spot in the back that our kids would sometimes play in...sometimes. Better use for this turf is a family garden! 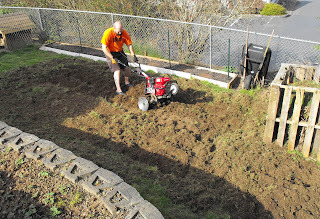 After the first till, my hubby rested and I raked out the clumps of grass. I'd say I got my calorie burn in. 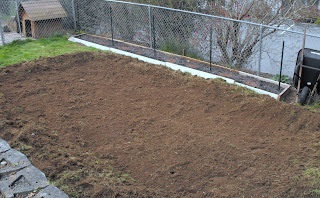 Granted, I did have the random thought about how building raised beds would have been...say easier..but in our quest to be frugal, the cost to rent a tiller compared to purchasing yards and yards of top soil was an easy decision. Finally a finished plot. We planted Sweet Pea's to kick things off and just in the nick of time too, while Saturday was mild and warm, a cold front moved in late afternoon and we had rain by dark. It's all looking terrific. You've all done a great job ... and it's a fairly decent-sized plot too. Just think of all the wonderful crops you can grow now. Looks great! That will be fun this summer. It looks great! It'll be worth all the work when it's full of plants. Gardening sure can be a good workout! Fertilizer Friday - my first post! A perfect start to spring! Cleaning the Strawberry Patch err Terrace?